London Mining Network, in consultation with JATAM (the Indonesian mining advocacy network) has developed the following Draft Declaration on Coal Mining. Many organisations have rightly drawn attention to coal’s contribution to destructive climate change. This declaration is intended to draw attention to other negative impacts of coal mining. The declaration is a work in progress and LMN welcomes comments from communities affected by coal mining and organisations working with those communities. Comments may be sent to contact[at]londonminingnetwork.org. If you or your organisation wishes to support this declaration, please let us know. The declaration will be amended from time to time. Coal mining disrupts both surface waters and underground aquifers. De-watering coal mines in order to access the mineral often deprives communities of access to vital water supplies for domestic and agricultural use. The washing of coal also uses enormous quantities of water. Open cast mining in ‘green field’ sites involves removal of enormous quantities of soil, rock and vegetation, which can cause permanent rerouting or disappearance of water courses. Removal of vegetation can also cause flooding. Flooding of mines because of heavy rainfall or ground subsidence, and spillages from waste ponds when dams fail, can cause serious pollution of water sources. Depending on the content of the coal, exposure to air and water can create sulphuric acid, leading to ‘acid mine drainage’, which triggers the release of toxic metals into the environment. Mining in forested areas involves the removal of enormous amounts of vegetation and can lead to permanent destruction of ecosystems. 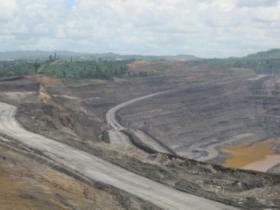 Many planned coal mines are in forested areas in tropical zones, rich in threatened biodiversity. Open cast coal mining produces large quantities of dust and particulate emissions. Exhaust emissions from motorised mine equipment add to the problem. These emissions can damage the health both of workers and of local residents. Spontaneous combustion of coal deposits through exposure of coal to oxygen, as well as combustion in power stations, produces pollutants which can be damaging to human health. In many places, Indigenous Peoples, farmers and other rural workers have struggled to prevent the development of coal mines, and the forced removals of people and destruction of rural livelihoods that accompany them. Opponents of coal and other mining projects are often specifically targeted for attack, including extra-judicial killings, false accusations and arbitrary arrest. Coal mining provides work for millions of people around the world. In some countries with a long tradition of coal mining, mine workers, their unions and their communities have struggled to protect jobs and existing coal mines. But coal mining is a highly dangerous and unhealthy occupation. Mechanisation is destroying many mining jobs. Short-term contracts and attacks on union rights are undermining working conditions. Coal and other mining companies must clean up the terrible damage caused by their past and current mines, without drawing on public funds, and be held morally, legally and financially responsible for their misdeeds. (2) See data in Dark Materials, as above.